Into the Demon Idol was written by Jobe Bittman. Art is by Stefan Poag. The publisher is Bloody Hammer Games. 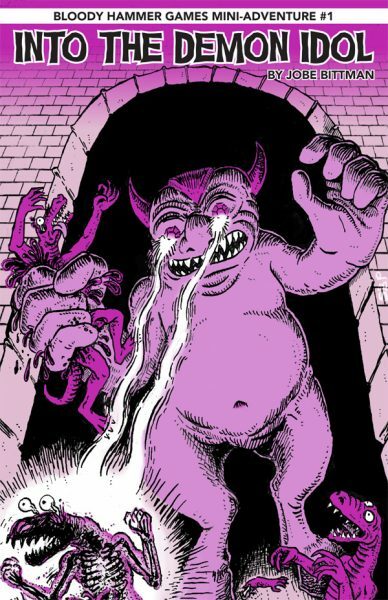 The original 1st Edition Advanced Dungeons & Dragons Player's Handbook had a cool cover illustration. A party of adventurers had just slain some lizard men and a couple of thieves were busy prying the gem eyes out of an enormous demon idol. But what if the demon idol was far larger? What if it was large enough to get inside it, and drive it around like a magical steampunk mecha? What if those gems did more than look pretty? Well, thanks to Jobe Bittman, now you can learn the answers. My understanding is that this adventure was originally a one-page dungeon in 2013, and then came out in an expanded format at GaryCon in 2015. Into the Demon Idol is not written for Dungeon Crawl Classics per se, but it does come with a sheet of statistics for use with DCC. Stats for Labyrinth Lord and Swords & Wizardry are also provided. In some cases, information on these stats is a bit sparse, and the prospective judge will have to make some calls, but this shouldn't offer any real difficulty. The adventure offers a hex crawl area, the demon idol itself, and a situation where the demon idol may be used to resolve a crisis. There are even some brief mass-combat rules that can be used if the PCs do attempt to resolve that crisis. There is a mislabeling on the map that may cause the judge a bit of confusion, but the text should help resolve it easily enough. Forgotten in a decrepit temple ruin, the demon idol holds a sinister secret. The giant statue was the superweapon of a depraved cult hellbent on ushering in a new age of chaos, but the cult fell to bitter infighting and their own lust for power decades ago. Their angry former patrons cursed them with hideous afflictions and sealed them within the idol for all eternity. Today, bloodthirsty lizardfolk tribes united under a common banner are cutting a swathe of destruction across the countryside. The village elders have sent you to the ancient temple in hopes of finding magic artifacts to help defend the town.